Escape to beautiful Maui while enjoying all the comforts of home. Our condos at Menehune Shores provide you with tastefully furnished one bedroom condominium apartments that are fully equipped and right on the ocean front. You can't get any closer to the ocean without getting wet! 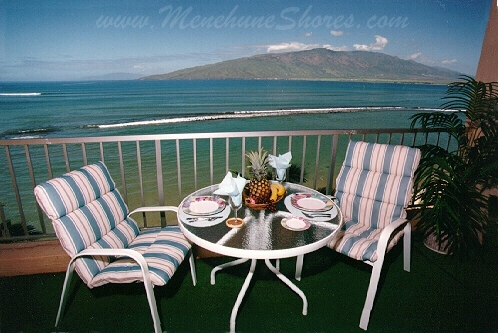 Menehune Shores is located on the ocean in Kihei just 8 miles from Kahului Airport. It is centrally located. We are 18 miles from Lahaina/Kaanapali, 3 miles from Wailea, and 20 steps to the Pacific Ocean. The best golf courses, shops, restaurants, and beaches are all within a few minutes drive. Luaus, theaters, horseback riding, tennis, fishing and diving/snorkeling facilities are nearby. distance of 4.2 miles. The beautifully landscaped grounds include a swimming pool, gas BBQ's and shuffleboard. On the roof there is a sunning area with more gas barbecues. have king or queen-size beds along with a hide-a-bed in the living room. beach towels, and a picnic ice chest. to allow you complete freedom and privacy. The sun sets over distant islands creating a gorgeous, romantic painting for you to enjoy in the evening. At night the moon and stars reflect on the water and you can hear the gentle sounds of the ocean. You never have to leave your condo to enjoy this spectacular show.